Congratulations!!!! Your boyfriend asked for your hand in marriage and you said, “YES!” After you have hired a wedding planner to help you plan your wedding it is time to get your new home set up. You won’t be staying at home with your parents any longer. How will you cook dinner for the two of you? Are you going to rely on microwave food or will you eat healthy fresh food? While you were cooking that yummy meal you accidentally dropped food and liquid on the kitchen floor. You need a broom and a mop to clean the mess. You are looking around your home and the carpet has dust and crumbs, how will you clean the carpet? Your bathroom needs to be cleaned, do you have the tools or are you going to hire a cleaning person? Once you have cooked and cleaned your home you decide to have some friends over for a special dinner. Wouldn’t it be nice to have some pretty plates and stemware to serve them food and drink? You have worked a long hard day and it is time to go to bed. Do you have sheets to put on the bed or blankets to snuggle under if it is chilly? So you might think that you don’t need to register, but think twice, you will need ALL these items and more. The first registry was from Marshall Field’s in 1924 for china, silver and crystal patterns. Today, couples register at 2 or 3 different stores with a varying price range of items. It is important that when you register, you pick places that you as a couple like but also keeping it easy for ALL of your guests to help you furnish your new home and start your new life. You should make sure that you are registered at least a couple of months before your bridal shower. Once you are registered, how will you spread the word of your registries? This is where your friends, family and your wedding website (if you have set one up) will come in very handy. It would be okay to include this information in your bridal shower invitation but in extremely poor taste to include in your wedding invitation. 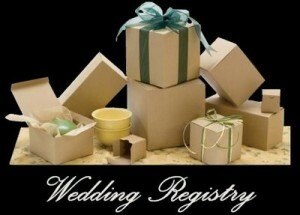 There are different types of registries. If you are leaving from your parents home to create a new home together, your best bet would be to opt for the TRADITIONAL registry. These items would include household items (sheets, towels, cleaning supplies, cookware, etc.) If you both have been living on your own and have all the traditional items you might want to consider the HONEYMOON registry or CHARITY registry. The Honeymoon registry is just how it sounds. You get set up with a travel agent or company (ex. World Ventures) pick out your travel destination and place to stay, guests can give a gift towards this excursion. Who wouldn’t love to be sent on a vacation that you planned yourself. The Charity registry is set up by couples that have traditional items already or if this is their second marriage. You would ask guests to donate to a charity that holds special meaning to you as a couple. Should you register at a store or two? ABSOLUTELY, get out there go shopping, register and have fun! The great thing about registries is that you and your fiance can pick out exactly what you want for your new home and life, now that you will get some of the items that you want for your home and not have to pay for it. Copyright © 2015 MJK Events. All Rights Reserved. Logo and Website Design by 910 West.